This is a beautiful traditional Hummus from Marijonas Vilkelis’s “Wolf & Lamb – Animal Free Cooking” Cookbook. Drain the soaked chickpeas. If you do not have a pressure cooker to use the water quantity above, simmer the peas and salt in just enough water to prevent them drying out. If you use too much water you will lose a lot of flavour and food value by having to discard some of the stock after cooking. Pressure cook the chickpeas and salt in the fresh water for about 45 minutes. While they are cooking prepare the remainder of the ingredients strictly in the following order. You will achieve a different flavour if you do not follow the order suggested. Blend the garlic in the olive oil until fine. Add the tahini and continue to blend until smooth. Allow to stand for 30 minutes before adding the peas and lemon juice. This allows the oil to “fix” certain flavours from the garlic. When chickpeas are cooked and still hot, add to the oil-garlic-tahini mix and blend until there is an even consistency. Add the lemon juice and continue to blend until very smooth. It should turn a creamy white colour during this stage. Allow to cool and then refrigerate. It should last 2 weeks or more. 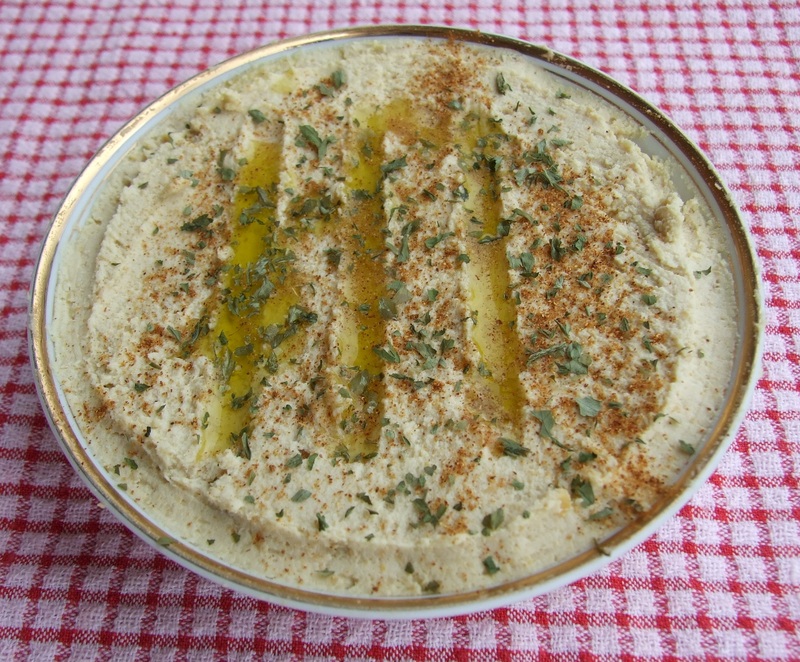 Spread the hummus about ½ cm thick over a shallow plate. Sprinkle with paprika or chili powder, a little parsley and then a few streaks of olive oil.